There were many breakfast cereal advertisements in the newspapers of old and some of them still exist today. We start with an article about breakfast cereals that appeared in the Saint Paul Globe in 1904 that talks about the different types of breakfast cereals and how to cook them. You can browse some of the best old breakfast cereal advertising we found, including Shredded Wheat, Quaker Oats and Pillsbury’s, plus some that went away with time. A GREAT cry went up in this country not long ago against the eating of cereals, not only cooked as breakfast foods, but in breads of different sorts. Many contended that cereals were in digestible, non-nutritious and only fattening. There was a time when certain persons denied themselves of wheat bread entirely. As for corn meal in any shape, they avoided it as they would poison and oatmeal and rice were not to be thought of. These persons, fortunately, were only faddists, and no matter what they should take a prejudice against they would be as violent in their denunciation as they were against cereals. Really, the reason for all this prejudice was never well founded. It was all the result of eating cereals not properly cooked; of indulging in half baked hot breads and watery, half cooked breakfast cereals, which should be cooked long and as dry as possible, so they may be chewed instead of swallowed like gruel and pap. There are too many living examples of the beneficial effects of a cereal diet for any one to attempt to establish an embargo against them. That bread is the staff of life is absolutely true, bread of wheat or bread of maize. Both cereals are the most important of all vegetable foods, and many great dietitians hold that they rank above all alimentary substances, animal as well as vegetable. Brinton, the greatest authority on foods, says that the various plants yielding cereals have been carried by man over the whole earth, with the result of his finding no latitude or climate in which one or the other of them will not grow readily, and that cereals constitute the chief element in the dietary of civilization. Brinton gives tables showing the nutritious qualities of all cereals, claiming for wheat the greatest value as a universal food. Here are some of the breakfast cereals they ate back in those days and how they cooked them. Hasty Pudding or Cornmeal Mush – Put a quart of water in a heavy porcelain-lined kettle over the fire and add a generous teaspoonful of salt. Mix one pint of cornmeal with a pint of cold water and when the water in the kettle over the fire comes to the boiling point, stir in the moistened meal and let it boil briskly for at least twenty minutes, stirring it continuously. Then stand it back on the stove and let it cook slowly twenty or thirty minutes longer, stirring occasionally, after which serve hot with milk. If the pudding is to be eaten cold, pour in more boiling water and stir briskly again until it is rather thin and then poor it out of the kettle into a mold, and when cold serve it with cream and sugar. If it is to be fried, turn the pudding into a long, narrow tin pan, and when cold cut it in slices and fry a nice brown in hot fat. Oatmeal Mush – Put a quart of water with a teaspoonful of salt in the upper part of a double boiler over the fire. When the water comes to the boiling point put in half a pint of oatmeal; stir it till well blended with water, then let it boil briskly for ten minutes, stirring occasionally with a boxwood fork. This is better than. a spoon, as it prevents the meal from lumping. After the mush has boiled ten minutes stand the kettle in the lower half of the boiler, filled to the proper height with hot water, cover the kettle and let the mush cook slowly for three hours. Then remove the cover of the kettle, stir the mush briskly for four or five minutes with the fork, and serve with milk or cream. Wheaten Grits or Cracked Wheat – This is one of the breakfast foods seldom seen nowadays. It has been discarded by most housekeepers be cause it is not so easily cooked as some of the more modern forms of cereal food but in all the list of break fast cereals none is more healthful or more nourishing. Wheaten grits must be cooked at least three hours or they are not fit to eat. and they must be cooked as dry as possible. To cook them, put a quart and a half of water, slightly salted, in a saucepan over the fire, and as soon as it is hot add half a pint of wheaten grits. Let boil gently for half an hour, stirring occasionally, then stand the saucepan in a larger one with hot water and let the cereal cook in all three hours; and let it be thick and as dry as possible. Serve with a very little cream and sugar, or with butter. Hominy – Put a quart of water over the fire in a kettle and add a generous teaspoonful of salt. When the water reaches the boiling point put in half a pint of hominy. Do not wash it be fore cooking, as it detracts much from its delicate flavor. Let the hominy boil briskly for nine minutes, then stand it in a kettle of hot water and let it cook an hour and a half, partially covered. Do not stir hominy while it is cooking. I hope you enjoyed reading this post on Old Breakfast Cereal Advertising and take something away from it. Its funny that back in those days they considered cooking oats or grits “fast food” or “something to put in your stomach” whereas today we consider this a home cooked breakfast item. I also thought about the cracked wheat being a bother to cook. These are whole oats or steel oats and are today making a come back as a healthy breakfast item. 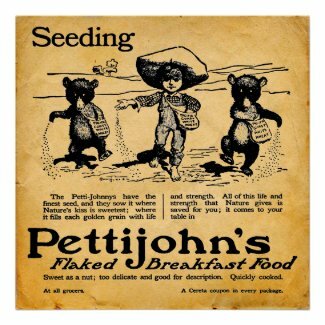 Purchase an old breakfast cereal advertisement as a print or poster from the Zazzle store.